Two new computer models are arriving later in 2014, adding to the already launched HT B22 Solid State Fanless product. The HT C02 and HT 221 will update and upgrade their predecessors in line with Hatteland Displays long-term product lifetime philosophy, providing system integrators with ongoing form fit function options. Building on the phenomenal success of the HT C01 within our range of products, the new HT C02 will be a continuation of this very successful platform, still delivering unparalleled versatility, but with enhanced new specifications. There will be a choice of no fewer than four! New processor options to choose from Intel® Core™ i3/i5/i7 CPU's as well as a new AMD CPU that will interest high-end graphics requirements in particular. 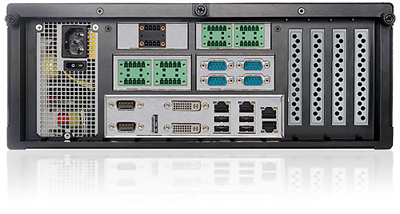 In addition, an upgrade for the HT 216 19" (2U) rack computer will arrive in the shape of the New HT 221 computer. Integrating much of the new technology additions going into the HT C02 it will provide a cost effective and versatile solution for easy rack mount integration. Both solutions will also provide enhanced Hard Drive or SSD capacity through 4 removal disc bays and will be able to house the New 'Connectivity Modules' (COM, CAN, DIGITAL) that are launching now.